Edited by zbox, 08 February 2014 - 06:03 PM. It has less bugs than the "original" one! Edited by Shadowrend, 08 February 2014 - 09:12 PM. It has less bugs than the original one! this is awesome :D and It's make more fun, because there is less bugs! Lulz. Dem gr8 mobile gaemz. Dey jus keep gettin' bettar & bettar! Fair play to the original creator of this. He must be laughing his a$$ off all da way to the bank. Also, nice job on da clone. Edited by Shadowrend, 08 February 2014 - 09:11 PM. Just enough time for him to go to his house in Dubai when the next $50k settle on his Swiss bank account. Edited by Shadowrend, 08 February 2014 - 09:41 PM. Here is my game called "FlappyCage" done in impressive 6 minutes! See you guys on the app stores... I'm finishing up my clone tonight hopefully and we can all come back here and discuss how much money we make by flooding a clone with ads! Edited by zbox, 09 February 2014 - 03:23 AM. How can I save the highscore in Android? The clones have already started coming onto da stores, lol! Edited by dadio, 09 February 2014 - 08:11 PM. How exactly do you change the sprites? 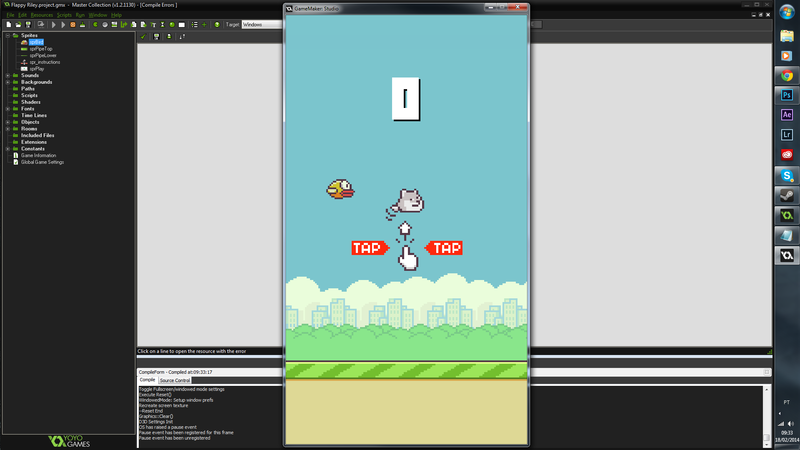 I'm trying to change the bird (which is 12x17) to a sprite that is 64x64, but it's too big. So I scale it down, but it becomes way too blurry. You need to recode the player object sizes. 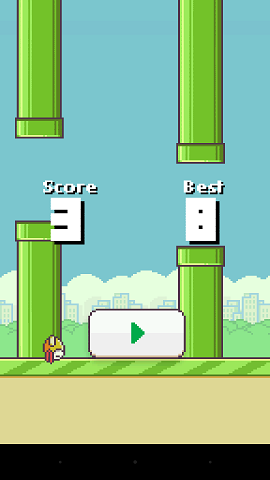 I definitely need to ask one question, unlike the real one, do you die when you actually *hit* the pipe, or rather die when you hit the air near the pipe?? Edited by zbox, 10 February 2014 - 05:02 PM. Thanks! I just changed the scale in the object players code. Now I'm having trouble customizing the pipes! I wanna make it a 24 x 5 sprite instead of a 24 x 1 sprite. When I do this, the game gets really funky and my new sprite gets scattered up through the ceiling and below the level. Help? The file doesn't show up when I try to open it. I have free version of studio and the target is set for Windows, does that have something to do with it not opening? I just got studio so I'm still figuring things out. 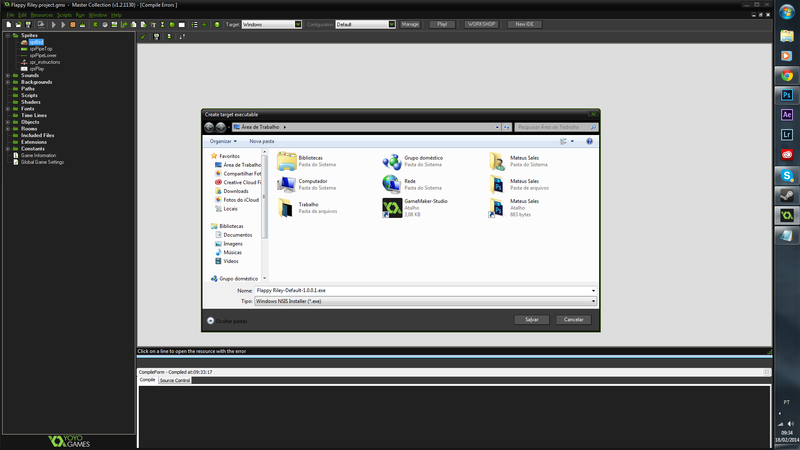 For example: I open game maker, then open my projects folder, but the file does not show up in there for some reason. Make sense? I'll do my best to further explain if needed. WAIT! 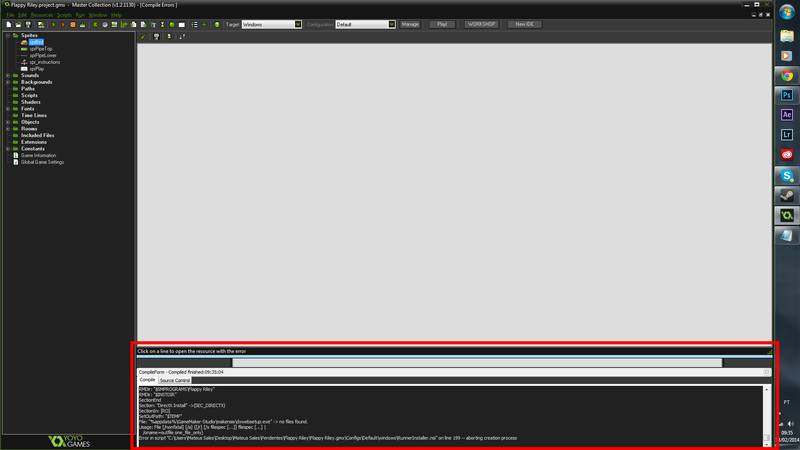 I just tried IMPORTING it, instead of opening it, and it worked. Nevermind, think I got it. I'm not a game maker noob mind you, just a STUDIO noob, and a community noob. Just don't double post. Edit it instead. I have removed a number of off-topic posts from this topic. if you guys want to discuss how to do other things, then make a new topic or use the PM system, but do not derail other people's topics with things that are not relevant to the OP. Ok I appreciate my post got deleted. Can someone help me with the score, well, keeping it more specifically. I've tried a couple of things, but I am very new to this and I'm pretty much learning by tutorials and just playing around changing variables. I tried a couple of things, and got errors saying it cannot find the .ini file. Maybe I'm doing something wrong, in that I am not creating it correctly? Should I be putting this in rooms, or in objcontrol? I'm trying to understand your code, but it's really hard. Edited by MarteenGreen, 14 February 2014 - 08:55 PM. 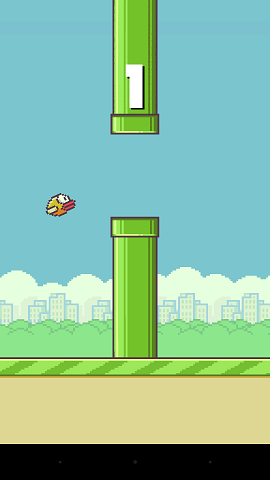 Behold: Flappy Phoenix. LOL in SD! Edited by theweirdn8, 15 February 2014 - 08:39 AM. I can play the game with GM, but everytime i try to compile into an .EXE file it shows me an error. I really liked this engine, and want to make my version for android, if someone can help me to fix this error, i'll be so thankful ! The high score resets everytime i open the game. Can someone show me the example of how to save the score externally on Android? Which part of the code is responsible for high score? Do not spam. 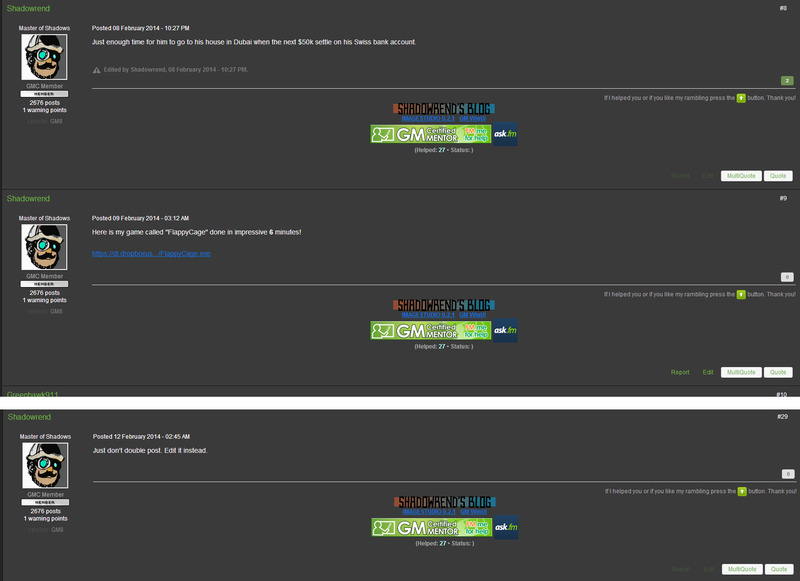 Read the forum rules. Edited by Shadowrend, 21 February 2014 - 08:50 PM. Well everyone for some reason it took a loooot longer than I expected but anyway, here you go, based entirely off this engine, my new awful game called Crappy Bird!! Edited by SlantingSea, 03 March 2014 - 09:25 AM.